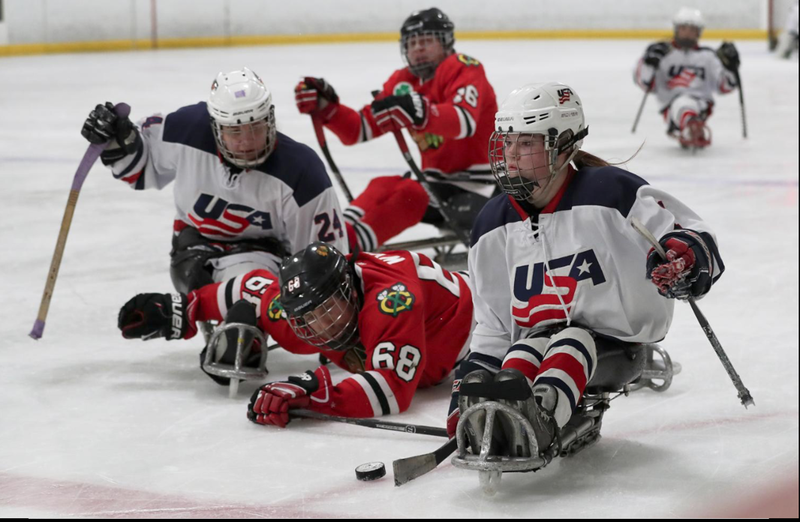 The 2018-19 U.S. Women's and Men's Development Sled Hockey Teams will train this weekend (Sept. 27-30) in Plymouth, Mich., at USA Hockey Arena. The joint training camp, which is the first official camp for both teams, will culminate in a scrimmage between the two teams. Thurs., Sept. 27 Women's Team Practice NHL 7:10 p.m. - 8:30 p.m.
Men's Team Practice Olympic 7:10 p.m. - 8:30 p.m.
Fri., Sept. 28 Women's Team Practice NHL 9:00 a.m. - 10:20 a.m.
Men's Team Practice NHL 10:30 a.m. - 11:50 a.m.
Women's Team Practice NHL 6:10 p.m. - 7:30 p.m.
Men's Team Practice NHL 7:40 p.m. - 9:00 p.m. Sat., Sept. 29 Men's Team Practice NHL 11:30 a.m. - 12:50 p.m.
Women's Team Practice Olympic 1:00 p.m. - 2:20 p.m.
Dual Squad Scrimmage NHL 7:30 p.m. - 9:50 p.m. The 2018-19 U.S. Women's Development Sled Hockey Team will be led by head coach Shawna Davidson (Duluth, Minn.), a three-time U.S. Women's National Team silver medalist, while the 2018-19 U.S. Men's Development Sled Hockey Team will be coached by 2002 Paralympic gold medalist Kip St. Germaine (East Falmouth, Mass.). USA Hockey Arena, home of USA Hockey’s National Team Development Program, previously hosted the U.S. Men's Development Sled Hockey Team in January 2017. The facility is a two-sheet facility with regulation ice (85x200) in the main arena and Olympic-size ice (100x200) for the secondary sheet and recently underwent construction to become fully sled-accessible. NOTES: Deloitte, Labatt USA and Toyota are proud sponsors of the U.S. National Sled Hockey Team ... Since being acquired by the USA Hockey Foundation on April 1, 2015, USA Hockey Arena has added 20,000 square feet to the property that included adding a 9,800-square-foot workout facility, additional offices and a conference center ... Since 2009, the U.S. has played in eight consecutive gold-medal games at the Paralympic and World Championship level. In that span, the U.S. is 6-2 and has claimed three Paralympic gold medals (2010, 2014, 2018) and three world championship gold medals (2009, 2012, 2015) ... USA Hockey's international council, chaired by Gavin Regan (Potsdam, N.Y.), has oversight responsibilities for all U.S. national teams.